Although the Tuna were pretty much only hitting one at time, our lightweight jig rods were able to convert a one fish stop into two or three, each time we paused the troll to land a fish. By the time our guests Ray, Brain, Jafar and Lawrance arrived at the boat, we had our ice on-board, and things ship shape, ready to go. After our usual safety briefing, we headed out through the hole into a pre-dawn dark ocean. After it got light enough to see, we headed out to a point we had plotted on the GPS which had sounded promising for holding a school of Tuna. At about the 25 mile mark (a little shy of our goal), things began to look favorable (color and temp) so we stopped for a quick test run. After deploying the gear and trolling for a few minutes, the sound of a screaming reel alerted us that we had found the day’s first Tuna! The morning proved to be a little slow, with a fish here, and a fish there, and no real hot bite, so we moved around a bit, but could not seem find the magic spot! The ocean conditions were good and actually got better as the day progressed. Although (as is usual when the weather is hot in the valley) we had to contend with the fog during various times in the day, but that’s why we have a good radar! As it got around to late morning, the catching really started to pick up. When we stopped to land a troll hooked fish, we pulled the lightweight jigging rods out of the holders and were able to pick up an additional 1, 2, or even 3 extra fish at each stop. Catching a big Tuna on a jig is truly an experience that has to be tried to be believed. We typically hook them directly under the boat (perhaps 20′-30′ down) where they make several blazing runs straight down several hundred feet! Wow, do they ever put up a fight! At about 12:30 after filling up the fish boxes with some very nice Albacore, we cleaned up the boat, and turned toward port (leaving a very active school of Tuna!) and our waiting crab pots. About half way back to shore, we spotted the spout of a whale, so we slowed to take a look, when suddenly, a very large Humpback Whale surfaced a couple about 50-75 yards from the boat. He surfaced and spouted a couple more times before finally sounding. This was a very special occasion, as we got a chance to see and hear one of the worlds largest animals closer than most people ever will. What a thrill! Back near shore at the pots, we pulled them from a depth of 40′-60′ to find some very big nice crab waiting for us, which rounded out the day nicely. On our return to port, we off-loaded our catch, fueled and put the boat to bed, and then got busy processing the fish and crab. A regular part of our routine now is to steam the crab and grill some Tuna steaks to snack on while we work. There is NOTHING better than fresh hot steamed Crab, moist hot Tuna steaks, and a cold beer or glass of wine. What another great day. We are very lucky guys indeed. Thanks for sharing the day with us! We host an accomplished Oregon and Alaska Salmon fishing guide for a day on the salt, stalking his first Albacore Tuna! The First, Largest, & Most! 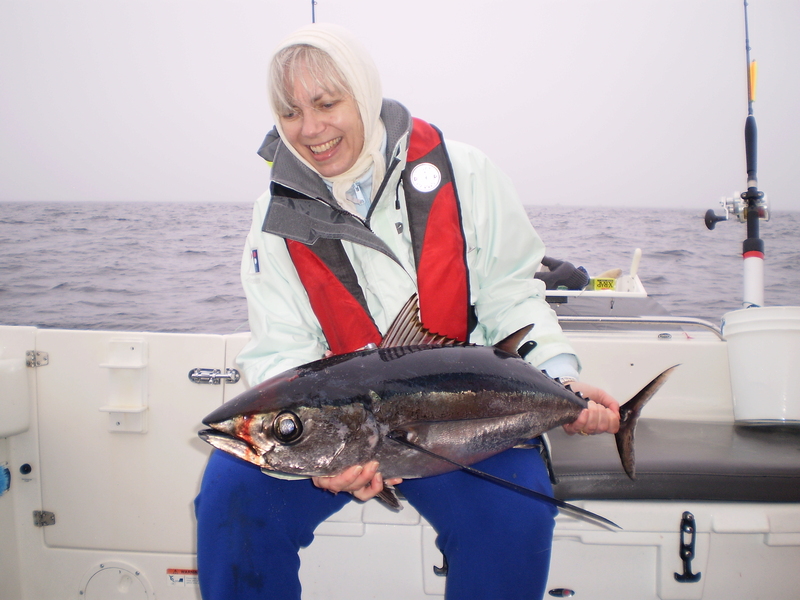 We didn’t know it at the time, but when we hauled in a Tuna one of our guests had caught, it would truly be a milestone occasion for her. It was not only the biggest fish she had caught, it was the FIRST fish she had ever caught…. Wow, what a first fish Daniela!! Joining us for the days adventure were Larry & Daniela and Gerry & Gladys. Larry and Daniela had won this trip in an auction benefiting CAT (the Cat Adoption Team), and had invited their friends Gerry and Gladys from Seattle to join them. The day began when our guests met us in Depoe Bay at the boat. It was still about thirty minutes before the sun was due to rise, when we slipped through the narrow opening into a dark and drizzly ocean. Because of the darkness and fog, we had to rely on our GPS chart plotter and radar as we slowly made our way along the buoy line into the open ocean. After the sky had lightened enough for us to see any obstructions in the water, we pushed the throttles forward and started our way at a comfortable 12 knots on a very nice ocean to a point about 30 miles west that we had chosen that might hold a school of Tuna. Upon arriving at a likely looking starting spot (good water temperature and color) we deployed the trolling lures and anxiously awaited the first screaming reel. We didn’t have to wait very long….. “Fish on” and we were into them, where Gladys proved that she may be small of stature, but she did not back down one inch during her battles with these extremely strong and tenacious speedsters of the ocean! Nice job Gladys, we were impressed! 5 fish landed on the deck in fairly short order, then the bite seemed to shut down, so we moved to a new area and again set out the gear. After trolling the area for awhile, we managed to pick up another 5 big fat Tuna when about noon, we decided to head home. The ride back was beautiful on a very flat calm ocean, with just a band of fog hugging the beach. On the way back to port, we stopped at the crab pots that we had set the night before. After pulling a couple of pots, it became apparent that someone had been tampering with them (stealing crab), pulling one of them almost 200 yards from where we had set it. Even with this set-back, we managed to collect enough big crabs for our coming feast. We re-baited and repositioned the pots, then headed in. After a quick run back to the harbor, we off-loaded the days catch, and prepared to fuel and put the boat in its slip. While waiting for the cleaning table to open up we cleaned and boiled the crabs and prepared to grill some Tuna! Our thanks to our guests Larry, Daniela, Gerry and Gladys for making this such a special day, we had a GREAT time! With an improving weather and sea forecast, and a taste of some good fishing Saturday, anticipation is very high for the day! Anticipation so high, that Todd decided to go for round two, and stayed over night with us to fish one more day! What a glutton for punishment! Joining Todd were Len and Pablo, to round out the crew for the day. Pablo has fished with us before, but this was Len’s first (and we hope not last) time fishing with us for Tuna. We had re-baited the crab pots Saturday night and left them for a long soak, so we idled out of the harbor into a dark ocean to try and find the illusive Tuna. We slowly worked our way west until we had sufficient light to see, then pushed the throttles forward and headed out. For lack of any better reports on the Tuna’s whereabouts, we pointed the boat to the same fishing grounds as we had left the day before. The sea conditions were much better than Saturday, so we quickly made our way out the 40 + miles to some fishy looking water. Sort of the same program as the day before…. gear out and “FISH ON!”. Trolling along we had fairly steady action, until the bite cooled down after awhile, and we decided to move to an area the radio chatter claimed a little better action. Again we trolled and hooked the occasional fish (all nice fish, with one of them 27-28#’s!) when near the end of our turnaround deadline of 12:30, the action picked up some and we had a very nice load of big fat Tuna loaded and iced in the fish boxes. On each of our stops to land fish, Todd had been going up on the bow of the boat to cast butterfly jigs with one of our lighter weight spinning outfits. On about the third stop, he hooked a fish! Now catching a Tuna on a troll rig is a thrill indeed, but hooking one on a jig rod is about the ultimate experience! Because they have not been tired by their usual blazing 100 yard run on the troll, a fish hooked just under the boat is something else again! As Todd found out, it becomes a real question in your mind whether you will be able to overpower this dang fish or not! After a skillful battle by Todd (and the Tuna :)), he was finally able to muscle the fish to the surface, where we gaffed it and hauled it in to the boat. Very nice job Todd! After cleaning and straightening up the boat and bringing out the traveling chairs, we headed back (very fast!) on a flat ocean to hopefully collect some more crabs from our pots. Upon arriving at the crab pots we pulled the first one to find 8 very large and feisty (OUCH!!!) male crabs. The other pots also contributed some big crabs to our growing collection, which we stowed and headed back to port. Back on the dock we hauled the fish and crab up to the fillet table and processing gear to package the catch for the trip home with our guests. The fish get filleted and packed in the vacuum packaging machine, and the crab get cleaned, boiled, and packed in bags, and all goes into coolers and ice. Our thanks to Todd, Len and Pablo for all your hard work cutting, packing and cleaning. You are gentlemen of the first order! We hope that this was a day you won’t soon forget. We know that we sure won’t! Thanks again guy’s, we had a GREAT day and weekend! Below is some proof of all of the fish and sea stories you have been telling, enjoy! The North Wind Finally Stops! Finally the north wind stops blowing for the first time in about three weeks, and we can head out to see if there are any Tuna in the area! We had been stuck in port for a few weeks, and were becoming anxious (maybe even grumpy?) to get back out on the ocean again. The wind had been blowing 20-25 knots consistently, day and night, and really fowled up a bang-up start to our 2010 Tuna fishing season. The problem with the strong north wind is twofold. The first problem is that sustained 20 knot winds build up quite a nasty sea, and secondly, it blows lots of C O L D water down from the north. The water got so cold that it drove the Salmon off shore, and even shutdown the bottom fish bite on occasion. But the REAL problem is that it pushed out the Tuna currents from about 18 – 20 miles off shore, to well over 100 miles and out of range for us! Earlier in the week the forecasts were showing a doable ocean, so we started to get excited for our next trip scheduled for Saturday with our friends Todd, Ron, Marty and Brock. Early Saturday morning the crew arrived at the boat, full of excitement and anticipation, hoping to venture after the ever wily Albacore Tuna. Because no one had been out for Tuna in several weeks, and because of a steady cloud cover, we could not rely on our satellite sea temperature and color reports, so we really had no idea where (or even if) the Tuna were. The sea conditions looked doable, so out through the hole we went. After clearing the buoy line, we turned north and ran a few miles where we set our crab pots for a few hours soak. From the pots we then plotted our course to a spot where we thought we might find some warm water and Tuna. We traveled in fairly good sea conditions for about 40 miles, where we found some water that might hold fish. Dave deployed the gear for the first troll, and before very long the cry of “Fish On!” went out, and we were into our first fish of the day! The fish came fairly steady for the next 4 or 5 fish when the bite kind of fell off. The chatter on the radio from the other boats in the area showed that the fish were apparently scattered, and were not in high concentrations anywhere. We decided to pick up and move west a bit, where we trolled for a while until we picked up a couple more fish and it was time to head for shore and check for crab in the pots. On the way back in we got a little show from a couple of humpback whales. We turned off the motors on the boat so we could hear them blow, when were surprised when one of them breached. Wow…. that was a pretty cool sight! Upon arriving near shore at our crab pots, we pulled them to find lots of BIG male crabs inside, which made a fitting end to a truly great day, spent with good folks, on a nice ocean. Back at the dock we fueled up the boat, processed and packaged our fish, boiled and ate some of our crab, drank a little beer and wine, and cleaned up our operation before our crew headed back to town with their booty of fat Tuna and big tasty crab to share with family and friends. This was the second year for Todd to fish with us and bring a crew, and one we were eagerly looking forward to because of the fun we had with them last year. They did not disappoint, and again proved to be thoroughly enjoyable companions for another adventure on the big blue ocean! We also want to thank them all for the work they did in helping us process the fish, and clean up the equipment after. WHAT A GREAT GROUP! Up Close To A Beautiful Albacore Tuna! First Tuna in the can! The first tuna of the season is now in the can! Well, we took in about 200#’s of fresh Tuna fillets to the caner (Tony’s in Oregon City) a week or so ago, and just got it back….. Boy oh boy, is it ever GOOD! We had to sample a can when it came in for “quality control” purposes. It was all we could do not to open several! Nothing rivals our canned Tuna! We take a great deal of care preparing our fish, starting just after bringing them in to the boat, where we bleed, clean and pack them on ice soon after catching them. With Tuna (even more so than with other fish) it is extremely important to pay attention to proper handing and preparation. When we get back to port, we spend the time to very carefully fillet them and either vacuum package (for fresh eating) or package and ice the meat for delivery to the cannery first thing Monday morning.